Ships within 5 business days. Please allow up to 1 additional week transit time for your item to arrive. 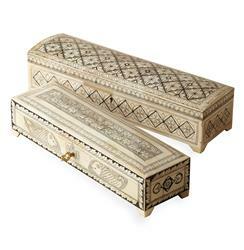 The mystery of what’s inside these carved bone boxes is palpable – with a lock and key unique to each, you can contain your treasures within these beauties without a second thought. Black flowery inlay designs adorn each slender box, giving them distinctly global flair. Tie the keys around your neck and smile - your secrets are safe.